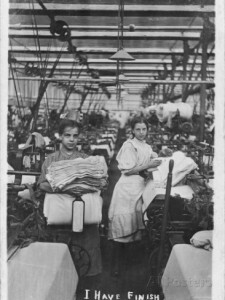 During the 20th century it is evident that many of the working class worked to live. This is evident through Doris’s portrayal of her father. We see his sheer determination to work and provide for his family as they followed him and his work around the country. Within Doris’s autobiography, in regards to often moving around during her childhood, Doris mentions at least 4 different locations at which they lived. In this period it was not unusual to up root your family and move away to follow work. The idea of uprooting a family is reinforced by Doris in her writing as she mentions how a certain school ‘must have been the third of my scholastic career’ (p2). This emphasises that the main priority was to put a roof over your families head, clothes on their back and food on the table. It was even a priority over Doris’s father’s health as she tells us that he never stopped working despite ‘further detriment his health’ (p3). He was diagnosed with ‘lameness’, ‘T.B. of the lungs’ and ‘Phthisis’ , yet ‘in spite of this he refused to stay in bed or even at home and continued to travel until within a fortnight of his death’ (p3) (p5). Even being told by a doctor ‘in no uncertain terms, that he was on his death-bed’ didn’t stop him (p5). It is suggested that his determination to work and earn money for as long as possible was because he knew he was dying. Doris tells us he ‘had probably known for a long time’, adding to his suffering ‘knowing that he was leaving a wife and four young children absolutely unprovided for’ (p5). In 1910, it was before the Welfare State had been introduced and therefore ‘when not working there was no money’ (p5). This reinforces the idea that working classes worked to live, as they needed money for them and their families to survive as the state offered no help. This is clearly highlighted by Doris when she says ‘What a great difference a Welfare State would have made to our lives in those next few years’ (p5). Doris marked her father’s death as ‘the end of another era in my life’ (p5). Here Doris is discussing the impact that her father’s death had on the family as they were left with no money or insurance. Therefore, her father’s death saw Doris’s mother entering the world of employment, becoming the breadwinner for the family. This was uncommon within society as it was ‘unusual in those days for married women to work’ (p7). Also it must have been strange for Doris’s mother as before her marriage she ‘had never been allowed to earn her own living’, her father provided for the family (p6). Doris’s mother worked heavy hours during both the day and night to earn a living for her and her children. She took on two jobs, dressmaking and teaching dressmaking. Doris’s responsibilities began with taking care of her sister during out of school hours. Although, at the age of 12 Doris had to go into ‘half time to work in the cotton mill and only half time at school’ (p9). She tells us that at this point ‘my childhood really did finish’ (p9). Her timetable was heavy, filled with both hours at the mill and at school every day. Looking back on her childhood Doris expresses that in 1913 nothing was thought of such hours, ‘but now I’d shudder to think of children having such a life’ (p9). In the present, 2015, the hours seem even more shocking. Especially for just 2 shillings and sixpence a week’ (p9). This shows a moment of realization for Doris as she sees a great difference in regards to attitudes to work. As readers we see an even stronger contrast to the world we live in now. At the age of 13 Doris had to leave school altogether, working full time in the mills. It is evident to us that Doris didn’t relish the idea of being a mill girl as she tells us, ‘I must admit that I never volunteered the information that I worked in a cotton mill’ (p10). She goes on to say ‘I was ashamed of the fact that I was a mill-girl’ as if her father had lived she planned to become a teacher (p10). Her ambitions stretched much further than the mill towns. This is confirmed when Doris took an office job at the age of 17, telling us that she ‘was so relieved to be in respectable employment’ (p11). In 1900’s it seems there was little time for childhood. In terms of context. it seems that many working class children had similar experiences to Doris in regards to work being prioritised over education. Julia Swindells tells us that ‘For the girls, the pull of paid employment for themselves or their mothers was sharply felt in towns’ (Swindells, 1994, 58). As Doris lived in a main mill town at this stage of her life she couldn’t get away from the looming prospect of employment, earning money was seen as a priority over education. It was seen that ‘girls often simply were too useful to be spared to go to school while the prospect of factory employment offered no encouragement to their schooling’ (Swindells, 1994, 58). 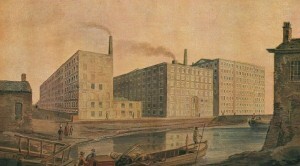 It has been said to have been a common theme in Lancashire for employment to be chosen over education as demand for schooling was limited. However, ‘with high levels of child labour and an inability to pay school fees or to provide decent clothing leading to low levels of school enrollment- and sometimes school failure’ (Swindells, 1994, 58). Therefore, it also worked the other way round as there was less of a service available because there is simply not enough demand. Overall, during the 19th Century there was only one priority for the working classes and that was working for their own and their families survival. 428 HUNT, Doris, Untitled, TS, pp.14 (c.5,000 words). Brunel University Library. Swindells Julia. 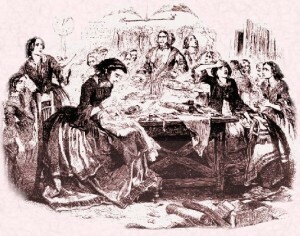 Victorian Writing and Working Women. Routledge London and New York, 1994.